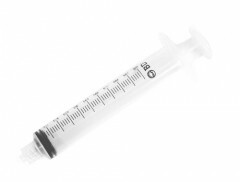 The Small 10cc Plastic Disposable Syringe is great for a variety of uses such as inflation of catheter balloons with sterile water, lube insertion, and quick water flushes. This small syringe holds 1/3 fluid ounce, and is the size that most associate with syringes for injections, for those looking for realistic medical scenes. The 10cc Disposable Plastic Syringe is essentially the same 10cc syringe that is included in the Complete Foley Catheter Insertion Kits, so you may want to purchase these if you are buying Single Foley Catheters without the Insertion Tray or as the Complete Catheter Kit. We recommend using sterile water for this, but good bottled distilled water can be used as a substitute. This small syringe is the size that most people associate with injections, which makes it popular for theatrical enhancement of scenes when used for small shots of water or application of lube. But remember to never allow these to be used on or come in contact with more than one persons bodily fluids. The 10cc Disposable Plastic Syringe is intended to be a single use disposable item; however, it can be cleaned with warm water and antibacterial soap when used as a lube applicator or when used with clean water. Comes with a cap that allows it to be filled with lube, and can be used over a weekend of playing. Never use on more than one person or let come in contact with more than one person's bodily fluids.